When the John Innes Centre were invited to present their cutting edge research at the Summer Science Exhibition in London, they turned to GGS for a custom solution that would showcase their work and stand them apart from other exhibitors. Being Scientists and Researchers, ( and so more technical than graphically creative 😉 ), they decided to get someone to do it for them. They knew what they wanted to present, knew their research & findings but needed some fresh insight to really give them the edge at the show. After some coffee, biscuits and a bit of a chat, Duncan, our exhibitions Director, came up with a great solution. Their stand although only occupying a small space of 4x2metres, would have maximum impact by using a variety of display equipment. 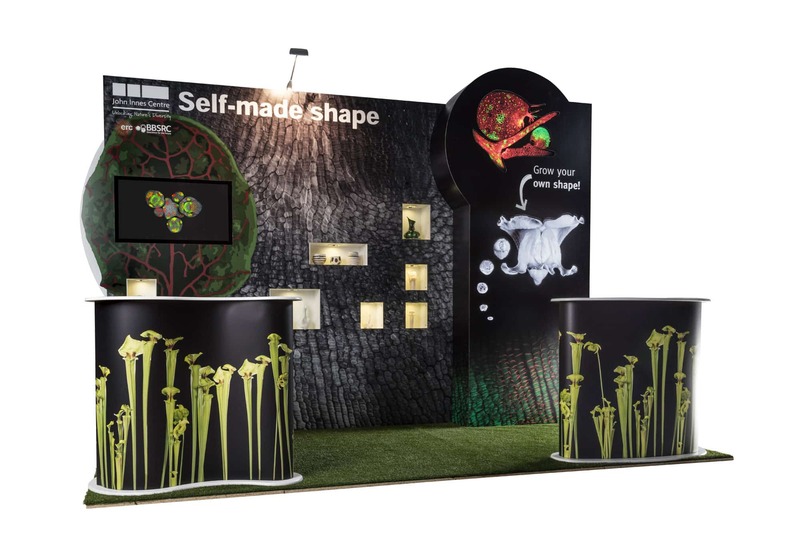 The custom modular stand was designed here at GGS and includes integrated showcases; for a neat yet effective product display, backlit trans; to highlight the shapes and exciting imagery on the stand, as well as the striking curve-shaped graphics mounted onto PVC and cut carefully to shape. The grass flooring and custom made counters also help to finish off the overall appearance. The stand was designed to be flat packed and it’s easy assembly means that John Innes can build it themselves on site next week. We think it’s quite striking. But what do you think?? This unique stand is unlike any we’ve done before but of course, as always, we’re definitely up to the challenge of creating new and interesting ways to exhibit. If you’re after something similar, or would like a new and unique approach to stand design, why not drop us an email?